Just as the Spring weather and flowers arrive to lift our spirits we also have an array of new gift lines from Baby Art to delight our retailers with. The new ranges come in the form of 5 new collections, each with their own style and decoration as follows: Essentials, Shiny Vibes, Wooden, Crystal and the Mr & Mrs Clynk. The clay provided in the gifts allows the user to make an impression of their baby’s hand, foot or both, and some a 3D creation. The material is safe to use on baby and dermatological tested. It fast to create (about 2 minutes plus drying time), whilst still allowing for multiple trials. The Essentials range covers the core products such as the magic box in both the round and square box design, in a neutral, subtle and timeless design. 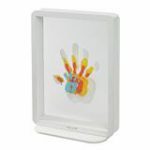 The collection also includes the My Baby Touch and My Baby Style frames, with the former having rounded edges, and being smaller in size making the works of art appear larger within the frame, with the latter offering a more sophisticated look, with larger, square borders around the baby print and photo. Baby Brands Direct holds in stock a range of gift frame colours and variations to suit a variety of needs and price points including white, grey and pastel, and some with space for one print and a photo, others with 2 prints and a photo. The Shiny Vibes collection is as the name hints, about all things glamorous using copper finishing and metallic patterns on its keepsake round magic box and its frames in the popular My Baby Touch in 2 styles covering 2 colourways, the white with 2 prints and grey with one. There’s also the eye catching First 3D that allows the user to make a 3D replica of baby’s hand and foot in around 15 minutes that can be treasured for years to come. The gift set also comes with a transparent frame to house the souvenir in, for a minimalist, chic look. Within the earthy, wooden collection, there’s charm and warmth. Our trade selection includes the My Baby Touch with 3 windows, the First Year (allowing for 12 photos of baby) and a clay impression. There is also the Tiny Style frame, which is very modern and attractive, having a white frame and wooden internal border around space for a photo and print of the users choice. Finally the My Baby Sculpture stays in the range, offering clay for 2 moulds and a sturdy wooden frame to keep them in as well as space for a photo. The brand new Crystal collection is excitingly modern, with completely clear frame windows – its every minimalists dream. In the range we have 2 frames, one which offers a clay impression and photo, whilst the other comes with paint so that a hand or foot print can be captured alongside a photo. There is also the family touch frame, that can take up to 4 layers of prints which can be assembled in size order for a dazzling, artistic and loving display. Last but not least is the annual limited edition prints this year designed by Mr and Mrs Clynk for Baby Art. The fireworks collection is in neutral hues and its design of fireworks of course reflects the celebratory feelings that go along with the birth of a baby. Also available is the Toucans design which is in exotic colours for a vibrant vibe and something complete unique. The range includes both designs in the magic box and also a gift box that contains an additional 3 keepsake boxes and a magic box. 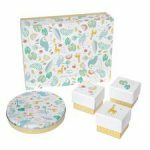 The Baby Art gift collection is an ideal offering to have in store, with its unique modelling clay creating a distinction against other gift frames and presents that is very appropriate to the new baby gift sector. Log into Baby Brands Direct’s wholesale website now to obtain supply of these gorgeous gift collections at the manufacturer’s trade price with no minimum quantity requirements. If you would like to become a stockists then you can apply for an account here.